I detest seeing numbers I don't understand. While I know that some companions have a critical crafting bonus, I began to wonder *exactly* how that bonus worked. Per usual, google searches yielded contradiction, confusion, misinformation (lots of it), and speculation. I didn't find that satisfactory. Clearing that up poses a bit of a problem. If the speculation is correct that a +2 crit bonus is an additional 2% crit... then that is an extremely small effect. And accurately capturing a small effect with statistics is tricky business. To show this, I simulated the results of crafting batches of 200, 1000, 1500, and 2000 grey-difficulty items, evenly split across two companions with 10,000 affection (a baseline 20% crit rate). For comparison, one companion did not have a crafting bonus. The other was given either a 2%, a 5%, a 10% or a 20% critical bonus. I did this 1000 times for each possible combination. 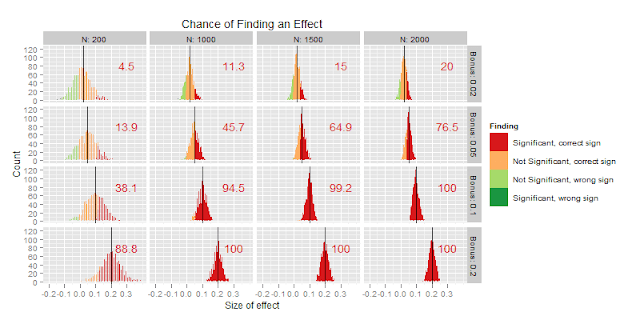 Below, I've plotted the distribution of effect sizes that I found, and colored them by whether that effect was estimated to be statistically significant. To have a reasonable chance of finding a small effect, it takes an absurd amount of crafting. Even after crafting 1500 items (750 on each companion), if a +2 crit bonus gives a 2% increase to the companion crit rate... I'd only have a 15% chance of finding an effect. (Note that there is an at minimum 5% chance of finding a significant result). Even worse: the estimate of that effect would be approximately 3 times the size of the true effect. To have even a 50% chance of finding any effect, I'd have to craft over 5000 items (at 45 seconds per item, that is just over 6 hours of continuous crafting). Fortunately, there are two ways to improve my odds. First, if I use a companion with 0 affection, then it is easier to distinguish between the baseline chance of a crit (now only 15%) and the companion-specific bonus. Second, since larger effects are easier to find, it helps to focus on a companion with the larger +5 crit bonus. Taking advantage of these two changes improves my chance of finding an effect after crafting 1500 items to 71%. I focused on two companions: Gault (10k affection, +2 crit biochem) and Jaesa (0 affection, +5 crit synthweaving). Each character had 400 skill in the corresponding profession. I crafted 750 items on each companion. As a baseline, I used companions without a critical bonus in the profession to craft 750 additional items. If +crit bonuses are truly percentage increases, then given the number of items I'm crafting, I should expect to see a bonus with Jaesa but not be able to distinguish Gault from the baseline. That is exactly what I find. Because the effect is too small to capture with the sample I used, I don't find any effect with Gault (crit percent 20.3% with a baseline chance of 20%). Fortunately, I do find a bonus with Jaesa (crit percent 19.8% with a baseline chance of 15%). This combination of results suggests that the critical crafting bonuses are percentage increases to the companion's crit chance. TLDR: The companion +crit crafting bonus is a percentage increase to their critical crafting chance. I'm probably going to use the terms wrong, but does that mean the increase is additive and not multiplicative? So the +5 increase is +5% to the base crit rate of 15% to get a crit rate of 20%? That seems to match your data. Otherwise, multiplicative (if that is a word! ), it would be 15% * 1.05 (1 + 5% bonus), which would only be 15.75 chance to crit. BTW, found your blog based on the new slicing results and am enjoying the numbers, nice job! Yup! As best as I can tell, its additive and not multiplicative. If it were multiplicative, the bonus would be so small I shouldn't be able to pick it up with this method.